After five years of work, the Environmental Protection Agency has released a new multi-state plan to reduce the Columbia River's toxic pollution, including tighter pollution standards, more public education and upgrading the patchwork tracking of pollutants in the massive basin. Funding for the "action plan" remains uncertain. And it comes after two decades of tribes documenting toxic pollution in the river and its fish. "This is a day we have been waiting for for a very long time," Kathryn Brigham, board secretary for the Confederated Tribes of the Umatilla Indian Reservation, said at a press conference today that included federal, state and Northwest tribal leaders. "We are working together. It's a path, a step in the right direction." The plan includes 61 actions to reduce pollution that range from boosting stormwater controls to promoting toxics-free certification programs for consumer products to expanding collection of pesticides and household hazardous wastes. Pollutants of concern include mercury, the now-banned pesticide DDT and fire retardants released to the river from sewage treatment plants. Some of the actions, such as convening scientific panels and identifying contaminated sites, can be implemented within current budgets. But Mary Lou Soscia, EPA's Columbia River coordinator, said the agency needs $5 million to $6 million to implement some significant "early actions," including more widespread public education, mercury collection and pesticide reduction efforts with agriculture. If successful, bills pending in Congress could help provide more money by September 2012, she said. Oregon and Washington are taking some steps now. Oregon is in the midst adopting new standards for pollution in fish that will be the tightest in the nation, for example. Washington worked with irrigators in the Yakima River Basin to lower runoff from soils contaminated with DDT and cut contamination in fish. The EPA convened a toxics workgroup in 2005. In 2006, the agency added the Columbia to its list of the nation's great water bodies, joining Puget Sound, Chesapeake Bay, the Great Lakes, the Gulf of Mexico, the South Florida ecosystem and Long Island Sound. Those other water bodies have received extra money from Congress to deal with pollution issues. To date, the Columbia has not. The Columbia starts at a Canadian glacier, runs 1,200 miles and drains a 259,000-square-mile basin that includes land in seven U.S. states and part of Canada. It passes the Hanford Nuclear Reservation and picks up agricultural runoff, effluent from pulp and paper mills, heavy metals from mines and industries, and pollution-laden sewer outflows from cities. 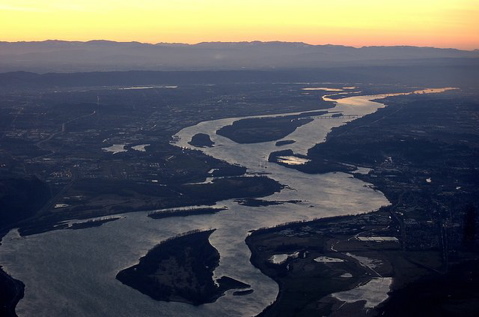 A U.S. Geological Survey analysis in 2008 indicated that fish in the Columbia system contained higher levels of lead than fish in the Mississippi and Colorado rivers but generally comparable levels of PCBs, DDT and mercury. But many members of Northwest tribes eat a heavy diet of Columbia River fish. And Northwest taxpayers and ratepayers are spending hundreds of millions of dollars to try to save wild salmon and steelhead that studies increasingly show are damaged by toxic pollution. "The action plan is a very good beginning," said Brett VandenHeuvel, Columbia Riverkeeper's executive director. "But all of us know it's going to take long-term perseverance."